There’s been talk about using mobile phones to pay for stuff for a long time, but until now it has been pretty much confined to Japan. But now the technology seems to be very much coming of age. Last week Orange and Barclaycard announced the UK’s first Near Field Communication (NFC) service, where consumers simply swipe their phone over a reader to pay for low value items. And now Google is poised to announce its own NFC platform, while Apple is reportedly planning to include NFC in the iPhone 5. The idea is a strong one – why carry around a pocketful of jangling change when you can just wave your phone and buy things? 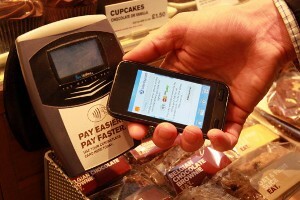 However I think adoption will be slower than predicted – while analysts Forrester predict that 40-50 million NFC equipped phones will be sold in 2011, how many will actually be used in practice? For me, coverage has to be total – if you still need to use cash in your local newsagent you’re not going to leave your wallet at home. And moving beyond early adopters the biggest fear is going to be privacy – the data you give up on your buying habits will be invaluable to retailers (and the likes of Google). For many people these fears will outweigh the ease of use that NFC brings – remember the protests that greeted the attempted introduction of RFID chips by Tesco and Gillette? Time for the retail and telecoms industries to be proactive, put in place a code of conduct and head off consumers’ privacy fears before they reach the front page of the Daily Mail……..
Social media – the megaphone for the village idiot? One thing that always amazes me about social media is how some people think it overrides basic rules of common sense. If you update your Facebook status to single, your husband/wife is probably going to be annoyed. If you tweet that you are at work with a hangover you’d better be sure that you have an understanding boss. Often it feels that social media is a megaphone for the village idiot. I’m not a social media Luddite by any stretch and can see the incredible power that channels such as Twitter and Facebook have to bring people together. Take football for example. The connection between highly paid sports stars and the fans that indirectly pay their wages has been fraying over recent years. You’re not likely to bump into Wayne Rooney down at Tescos and all ‘official’ interviews are heavily vetted by agents and PR people, often turning them into bland stories devoid of any interest. Social media and Twitter in particular has provided the opportunity to change all tha t – footballers (and any other celebrity) can tweet about the most mundane details of their lives. It is kind of reassuring that a multi-millionaire spends his spare time watching EastEnders and moaning about the weather. But going back to the megaphone/village idiot metaphor footballers need to think before they type. 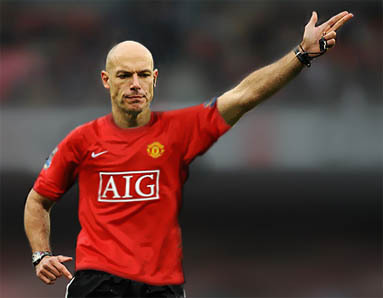 Ryan Babel of Liverpool’s now infamous tweet depicting ref Howard Webb as a Man Utd player has brought the wrath of the FA down on him. While it is fair enough that players need to be careful what they tweet (back to common sense again) it would be a real pity if it stopped footballers interacting with their fans because they are worried about speaking out of turn. Simply engage brain before tweeting – it is football’s chance to build lasting relationships with fans, rather than be seen as overpaid village idiots.